If you want a 10 X 8 shed that is a little more on the high end side, then the Extra High Supreme Apex 10 x 8 Shed could be just what you are looking for. As this is 8 X 10 it offers plenty of floor space, but what makes this shed extra special is the fact that it has elevated eaves. This makes the roof extra high which will make walking around in the shed nice and comfortable. Speaking of comfortable, the shed also has two windows that will let in plenty of natural light and the extra wide door will make getting things in and out very easy. While this is a very practical shed, it is also a very good looking shed, and the smooth modern look will make it stand out in any garden. This is a very smartly designed shed. 12 mm thick tongue and groove cladding has been used throughout. 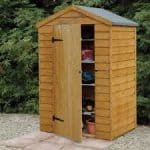 This, along with the very robust frame, make it a shed that is very solid and long lasting. In its standard form this is one very impressive shed, but they do actually offer a number of different upgrades if you want to make the shed even stronger. In all, this really is one very well made shed. When we first saw pictures of the Extra High Supreme Apex 10 x 8 Shed, we were impressed right away. It has a very modern and classy design to it and in general it is the kind of shed we are sure most people would love to have standing in their garden. At right around 10 feet wide and 8 feet deep, this is a shed that offers you a very nice amount of floor space to play with. You will be able to fit plenty of items in here or even use it as a snug workspace. One of the huge selling points of this shed is the fact it is extra high. They have made this shed with elevated eaves – the eaves height is actually 6 feet 3 inches, which is just incredible. Along the ridge the shed stands at just over 8 feet high, so when it comes to headroom this is one of the most impressive sheds we have seen. Moving around in here is going to never require you to hunch over and be uncomfortable. The reverse apex roof is great and we really like the slight overhang that they have done as well. Made with tongue and groove boarding, this roof is very well made and it also looks fantastic. This is actually quite a steep apex roof so you will not have any worries about rain sitting on the roof for ages and making its way into the shed. Covering the roof boards is some standard roofing felt which may not be the fanciest in the world, but it certainly gets the job done. 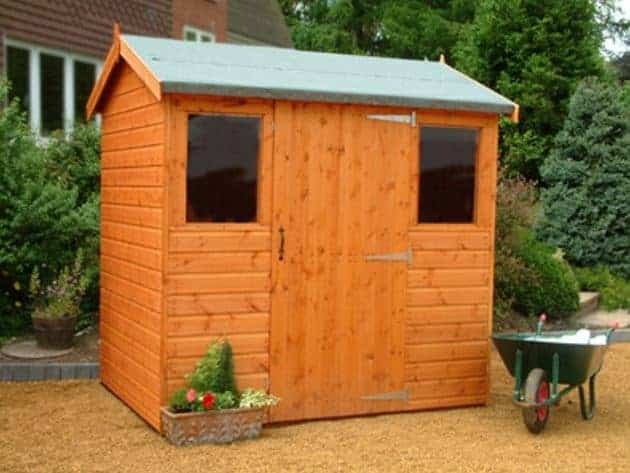 The Extra High Supreme Apex 10 x 8 Shed is made with some gorgeously smooth 12 mm thick tongue and groove shiplap cladding that is made from very strong redwood. We love this cladding and the way it is made ensures there is no way for rain to sneak inside. This kind of cladding is not just used because it looks great, it is used because it really is the best style of cladding for strength and keeping the elements at bay. The cladding is thick and strong, but connected to this cladding is a very impressive 50 mm x 38 mm frame. This frame is incredibly solid and we are certain that it is going to be a major reason as to why you get 20 plus years of use out of this shed. The frame and cladding really do make one very impressive team and make the shed very robust. As standard, the shed comes with a 12 mm thick tongue and groove boarding floor. This is one very strong floor and we are sure that you will love how solid it feels when it is under your feet. This kind of flooring is made to take a lot of weight, so no matter what you want to store in here or how many hours you want to spend pottering around, we have no concerns over the floor’s strength at all. Also, this kind of flooring is very easy on the eyes and really makes sure the inside of the shed has a smart and uniform look to it. 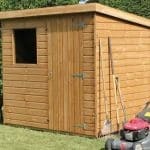 As standard, the Extra High Supreme Apex 10 x 8 Shed comes to you having been dip treated. This kind of treatment is only there to protect the wood during transit and installation. 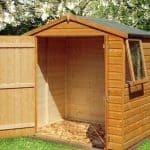 You will have to give it a coating of wood treatment once you have installed the shed and then on an annual basis thereafter. If you do not like the idea of giving the shed an annual coating of timber, then you can pay an extra £254 to have the shed made with tanalised timber which will not need annual treatment. Like other similarly made sheds, this one here comes with a ten year anti rot guarantee which is only valid as long as the wood is treated properly. We really like the door that they have used on this shed. It is a single door, but at 3 feet wide it offers you plenty of room to get in and out of the shed. This door is also very well made as it is kept in place by three large hinges and from a looks point of view we must say that the vertical cladding looks awesome with the rest of the shed. One thing that is really great about this shed is that they let you put the door in one of five different positions. So if you do not like the fact this is a reverse apex shed, you can actually have them put the door on one of the ends. This shed comes with two horticultural glass windows. The standard layout for these is one either side of the door, but if you move the position of the door then the position of the windows will change also. We really like these windows and think that the horticultural glass is fine, but if you want, you can actually upgrade the windows to toughened glass for an extra cost of £33.99. If you take an extra close look at that awesome front door, then you will see that it does in fact have a keyhole. So once you are done pottering around or using your tools, mower or whatever, you can safely lock everything up inside of here. In general, this is one very solid and secure shed, so we are sure you will not have any security concerns at all. While this shed does have two windows, we do not think that it suffers from a lack of privacy as a result. The windows will let in plenty of natural light, but they are not so large that people walking past your garden will be able to have a sneaky look inside. We mentioned earlier how you can change the wood to tanalised wood, but as well as this they do let you change the colour. For a price of £254, you can change the colour of the shed. How many colours do they have? Well they offer an incredible 30 different colours! Bizzy Izzy, Deep Blue Sea, Berry Magic and Moon Dust are just a few of the exciting colours that they have to choose from. We have already touched on a couple of the extras such as the windows and roofing felt, but there are a few more to consider. First of all is the floor. We love the standard floor, but for the price of £85, you can upgrade to a 18 mm thick floor. You can also add a set of floor bearers which may come in handy if you plan on working inside the shed. These can be added for the pretty reasonable price of £59. They also offer different options to finish the roof if you are not too keen on the standard roofing felt. Heavy duty felt can be added for £62, but if you want something a little more high end, then they do offer a gorgeous tiled roof. However, it is rather pricy at £290. The quality of this shed is just incredible. 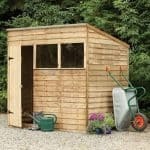 While they offer plenty of upgrades, we are happy with just the standard features of this shed and feel that they have really made a great shed here. 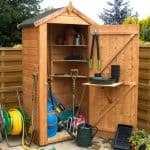 As long as you look after the wood, we see no reason at all as to why this shed will not give you a lifetime of use. It is very solid and built to take anything the weather can throw at it. While there are sheds bigger than 10 X 8, we have to say that this shed, when it comes to headroom, is one of the most impressive we have seen. If you live in the Midlands area, the asking price actually includes and installation service which is great. But if you do not, then you will have to get a friend to help you install the shed. We do not see this being all that hard, but the extra height of this shed will certainly make it so you need at least one other person helping you out. We know some people will take a look at that price tag and move right along, but this honestly is one of the best made 10 X 8 sheds we have seen in quite some time. The fact is, if you want the best quality materials, then you have to expect to pay a little more for them. Final Thoughts: The Extra High Supreme Apex 10 x 8 Shed is a shed that really has impressed us. Even if you just flat out ignore all the “upgrade” options, this is still one very impressively made shed. We just love how strong and enduring the shed is. The roof, floor, walls and the frame all come together to make a solid structure that is going to last many years. Plus, it is impossible to ignore the fact that this really is one incredible looking shed. 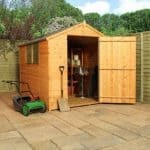 While it may be priced considerably higher than some of the other 10 X 8 sheds we have looked at, we do feel that for those who want the very best when it comes to quality, this is a shed that you have to seriously consider.